Welcome New Zeta Phi Beta Sorority members! 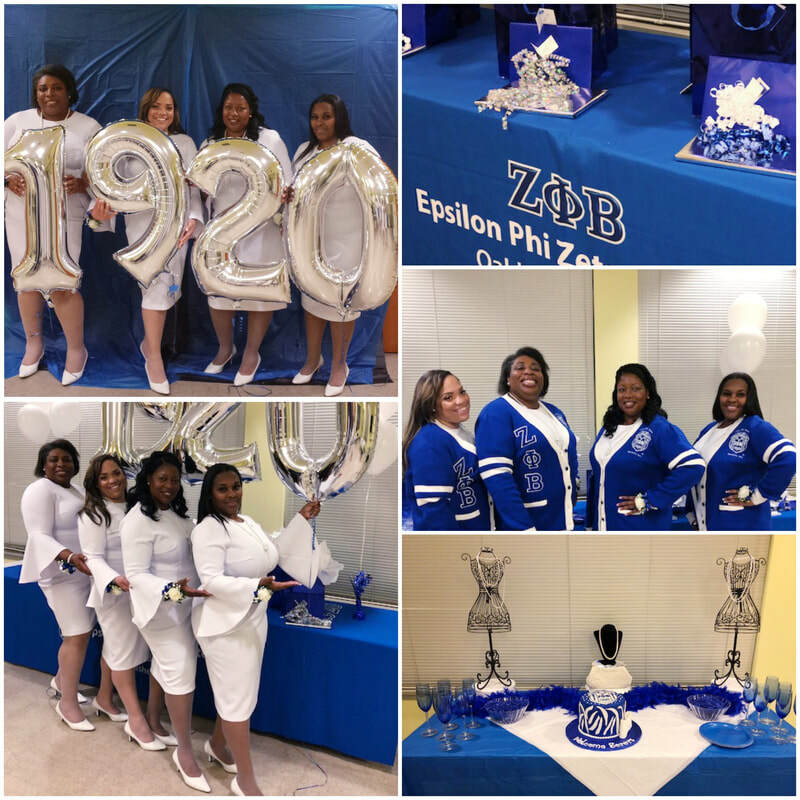 On December 19, the Epsilon Phi Zeta chapter inducted four new members into our amazing Sisterhood-- Sorors Kenya Broadnax, LaSonja Hill, Regina Johnson and Tiniece Thomas. These four new members are eager to roll-up their sleeves and be a part of building our community-conscious, action-oriented organization! We're thrilled to have to welcome them into our organization! On June 23, Epsilon Phi Zeta installed its new officers for the 2018-2020 Sorority years! We thank all of our outgoing officers for doing a fabulous job shepherding the chapter for the past two years--Sorors Tedra Grogans, Bridget Bobo, Barbara Dell, Pam White, and Linda Taylor. We are indebted to you for your tireless efforts for Zeta. On June 3, Epsilon Phi Zeta chapter awarded five high-achieving young women a $1,000 scholarship to attend a number of colleges and universities. The awardees will be attending both Historically Black Colleges and Universities like Howard, Spelman, and Dillard as well as local universities like San Francisco State. We wish our awardees much success in college and beyond! Bay Area Sigma Zeta Council featured in the Oakland Post for our joint Phi Beta Sigma Fraternity and Zeta Phi Beta Sorority Founders' Day. The Lillie B. Francis award was given to our own chapter member, Soror Jonelle Campbell! Scholarship applications for Fall 2018 now available! Please download the below application to apply for one of Epsilon Phi Zeta's scholarships. Multiple applicants will be awarded! Postmarked deadline to apply is April 18, 2018. Please use the "Contact Us" form or contact the Scholarship Chair (found in the application) for more information. Zeta Phi Beta Sorority Inc. celebrates Founders' Day and the launch of the Global Year of Service on Martin Luther King Jr. Day. Epsilon Phi Zeta's service mentioned! WASHINGTON, Jan. 16, 2017 /PRNewswire-USNewswire/ -- On the observance of Martin Luther King, Jr. Day, Zeta Phi Beta Sorority, Incorporated celebrates Founders' Day by completing hundreds of community service projects, and declaring 2017 the Global Year of Service. These service projects begin the official count toward completing 20 million service hours between now and Founders' Day 2020. "Today, we share Jan. 16 with a very special man – Dr. Martin Luther King, Jr. – who once said "life's most persistent and urgent question is 'what are you doing for others?'" said Dr. Mary Breaux Wright, International President. "It is only fitting that as we celebrate, we will serve," added Wright. Since its inception, Zeta has continued its steady climb into the national spotlight with programs designed to demonstrate concern for the human condition both nationally and internationally. Last week, women's empowerment advocates, Dr. Anita Hill, Esq., Cynthia James and Rhona Bennett were inducted in the sorority as honorary members. Zeta Phi Beta Sorority, Inc. was founded on Jan. 16, 1920 by five co-ed students at Howard University that envisioned a sorority that would promote the highest standard of scholastic achievement and Finer Womanhood. Headquartered in Washington, D.C., Zeta has a diverse membership of more than 120,000 college-educated women with over 800 chapters in North America, Europe, Asia, The Caribbean, Africa and the Middle East. For more information about Zeta Phi Beta Sorority, Inc. visit www.zphib1920.org and follow on Twitter @zphibhq. The Scholarship Application is Due April 21, 2017! If you're a High School Senior in the San Francisco Bay Area (or know someone who is), now's the time to download the Epsilon Phi Zeta scholarship application for the 2017-2018 school year. Scholarship qualifications and other information can be found in the application packet. The deadline is Friday, April 21, 2017. Contact us for additional information. Follow Epsilon Phi Zeta Chapter on Social Media: Did you know that you can get more info and pictures about the Epsilon Phi Zeta chapter by following us on social media? We're ZetasEastBay (@zetaseastbay) on Facebook and Instagram, and @ZPBEPZ on Twitter. Oakland, CA - December 11, 2016. 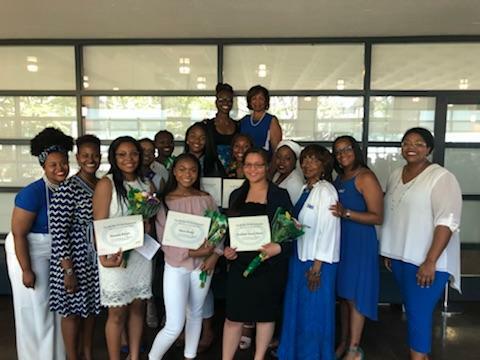 Today, Zeta Phi Beta Sorority, Inc.'s Oakland-Berkeley chapter added new members to its ranks: Sparkle Allen, Diahanna Christie, Amelia Neal, Sherlynn Thurman, Krystal Williams. The new members were happily welcomed by chapter members, as well as the organization's Northern California State Director Zakkiyyah Nazeeh, after a moving ceremony. The chapter's first vice-president, Tedra Grogans, stated "It's been a joy getting to know these women.They are all very different, but they share the bonds the bind all Zeta Phi Beta women together. I'm excited to see them doing the real business of Zeta--advocating for and serving communities in the San Francisco Bay Area." About Zeta Phi Beta Sorority, Inc. -- Zeta Phi Beta Sorority, Inc. was founded in 1920 by five co-ed students at Howard University who envisioned a sorority that would promote the highest standard of scholastic achievement and Finer Womanhood. 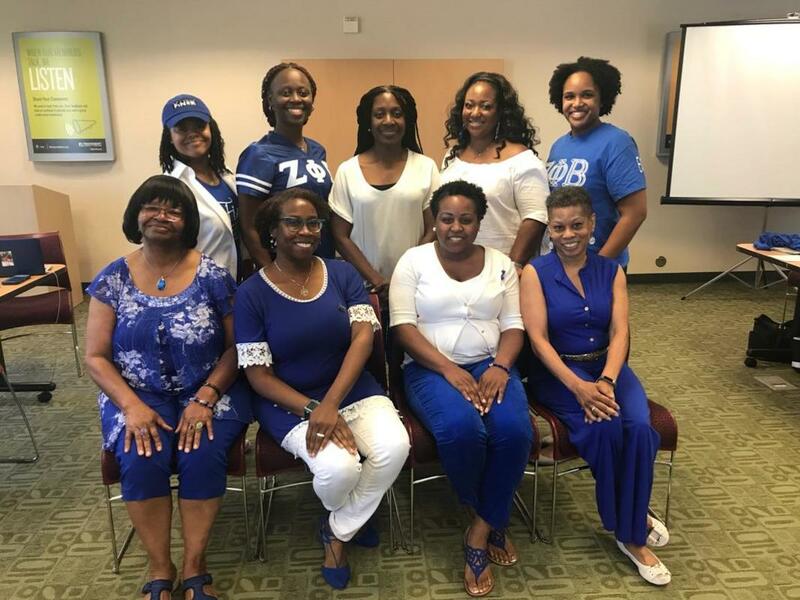 Headquartered in Washington, D.C., Zeta Phi Beta Sorority, Inc. has a diverse membership of more than 120,000 college-educated women with over 800 chapters in North America, Europe, Asia, The Caribbean, Africa and the Middle East. For more information about Zeta Phi Beta Sorority, Inc. visit www.zphib1920.org. June 2016-- 2016-2018 Chapter Officers. Epsilon Phi Zeta chapter welcomes our new officers for 2016-2018. We'll be working hard for our community, for the love of Zeta! 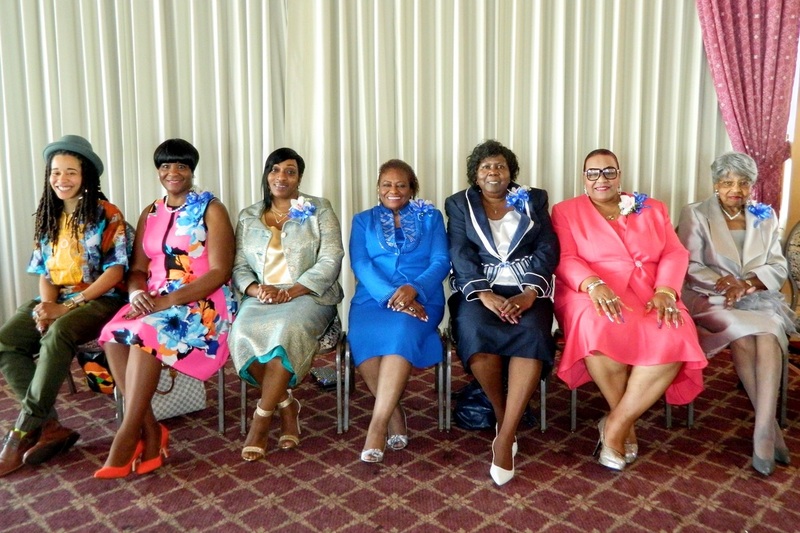 From left to right: Alice Westbrooks, President; Tedra Grogans, First Vice-President; Bridget Bobo, Second Vice-President; Nichele Laynes, Third Vice-President; LaTanya Brown, Secretary; Barbara P. Dell, Corresponding Secretary; Pam White, Treasurer; Linda White Taylor, Financial Secretary; Zeola Slaughter, Parliamentarian. Congratulations to our new officers! Million Sock Drive. The California State Zetas are collecting socks to provide to unhoused populations. Socks are the #1 requested clothing item in shelters. Our goal: One Million Socks! So if you have new or nearly new socks that could use a good home, please contact us and we'll work with you to pick them up! March 2016-- Christian Woman of the Year 2016. Epsilon Phi Zeta celebrated the 36th Christian Woman of the Year and Scholarship Luncheon on March 26, 2016 at HS Lordships in Berkeley. 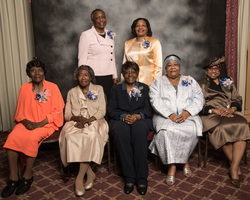 Eight women from a variety of Bay Area churches were honored for their dedication to service. This year's honorees included: Sloan Noel-Johnson, Imani Community Church; Maxine C. Johnson, Paradise Baptist Church; Janice Alexander-Burrus, Church of the Living God PG of T; Loe Ressie Montgomery-Branch, Allen Chapel AME; Loretta Fay Moody, Allen Temple Baptist Church; Charlene Moore, City of Refuge United Church of Christ; Georgia Stowers, Antioch Missionary Baptist Church; Hattie Tate, Cornerstone Missionary Baptist Church. 2016 Epsilon Phi Zeta Scholarship Applications--Apply Today! January 2016-- Download the Epsilon Phi Zeta scholarship application for the 2016-2017 school year. Scholarship qualifications and other information can be found in the application packet. Deadline is Monday, April 18, 2016. Contact us for additional information. January 2015-- During the 31st Annual California State Leadership Conference, Epsilon Phi Zeta was awarded first place for raising the most money among Northern California Zeta grad chapters for March for Babies (March of Dimes). And our very own Soror Tedra was lauded as the number one individual fundraiser for Zeta in Nor Cal! Way to go Sorors! Epsilon Phi Zeta Scholarship Applications Available! December 2014-- Scholarship applications are now available for the 2014-2015 year. The chapter provides $1000 scholarships to deserving high-school African-American female seniors living in the San Francisco Bay Area and attending a four-year college or university in Fall 2015. Application deadline is Monday, April 13, 2015. Download the application below. Feel free to distribute to anyone you feel might be interested or qualified. OAKLAND, CA-- December 10, 2014—On Monday, December 8, the Zeta Phi Beta Sorority Inc.’s Oakland-Berkeley chapter initiated three new members into the organization: Jonelle Campbell, Jaliza Collins, and LaToya Keller. The three Oakland women completed the Sorority’s membership intake, a process that enables the new members to learn more about the Sorority and its history. The current chapter members and other sorority sisters joyfully greeted the new initiates after the ceremony with hugs and gifts. September, 2014: Sharon Kidd has received the "Certificate of Appreciation" from the California Peace Officer's Association. Ms. Kidd has been a member of the BART Citizen's Review Board for several years, now serving as the Board's president, and was nominated by BART. She will be receiving her award at the luncheon during the California Peace Officer's Association Expo October 6-9. Please join us in congratulating our president for a job well done! July 2014 - At the Sorority's biennial convention in Washington DC earlier this month, two new honorary members were inducted into the organization--Congresswoman Donna Edwards (D-MD) and civil rights activist (and daughter of Civil Rights great Hosea Williams) Elizabeth Omilani. Please download the press release below for more information. The Spring/Summer Issue of The Archon is Published! The latest issue of The Archon was published today (June 10, 2014)! The Archon is the national organ of Zeta Phi Beta Sorority, Inc., and is published several times a year. Check out information about the Sorority, and our local Pacific Region. Read all about it here: http://issuu.com/thearchonzphib/docs/archon-spring2014-final or just read it below. Epsilon Phi Zeta Supports Two Candidates for Zeta Phi Beta National Executive Board! May 2014: Epsilon Phi Zeta is pleased to announce its support of two candidates for Zeta's National Executive Board! Soror Diane Fisher has announced her candidacy for the National Treasurer position. Life member and ZOL-certified Fisher has had more than 25 years of corporate finance experience and has served as the treasurer on the state and regional levels. To read more about Soror Fisher, please check out her Facebook election page at https://www.facebook.com/#!/Fisher4Tamias or search the hashtag #Fisher4Tamias on Twitter. Soror Bibliana Bovery has announced her candidacy for the Second National Vice-President position. Life member and ZOL-certified, Soror Bovery has had many years of Sorority experience, including Southern California State Director, National Director of Honorary Membership, and is currently a National Trustee. To learn more about Soror Bovery, please visit her Facebook election page at https://www.facebook.com/BiblianaBoveryForNationalSecondAntiBasileus. Epsilon Phi Zeta Does It Again! 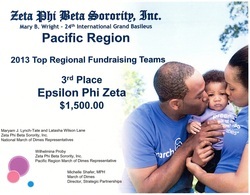 At the April (2014) Pacific Regional Executive Board Meeting, Epsilon Phi Zeta Chapter was recognized as one of the top regional fundraising teams for the March of Dimes (March for Babies) walk in 2013! It's not too late to help us make it on top again in 2014. Visit our fundraising page at Zeta Phi Beta - Epsilon Phi Zeta to donate! celebrated their 35th anniversary with the Christian Woman of the Year Awards and Scholarship Luncheon last week at Hs’ Lordship Restaurant in Berkeley. of Living God; Phebia Richardson of Downs Memorial United Methodist Church; Lynne N. Wheelock of Antioch Missionary Baptist Church; and, Havis White-Blanchard of Imani Community. Proceeds from the luncheon will benefit the chapter’s college scholarship program. “This is a great way to recognize women in the community and raise much needed college funds for deserving young women,” said Chapter Member Zeola Slaughter.